10 handy Blankets for 1 low price. 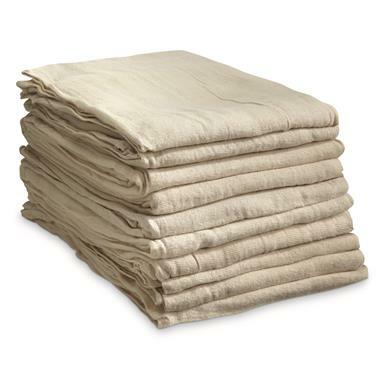 Stock your linen closet at home, cabin or deer camp with this 10-pack of Pakistan Military Surplus Emergency Blankets. Each is made from a soft, comfortable, machine-washable blend of cotton and polyester. Use them as lightweight blankets or durable bed sheets. Each measures a generous 60"w. x 86"l.
Pakistani Military Surplus Emergency Blankets/Sheets, 10 Pack, New is rated 4.7 out of 5 by 3. Rated 4 out of 5 by LCI115 from not bad I see they have corrected the online description now, in the original listing said they were linen, but they are just poly/cotton. would have given 5 stars if they had been what I thought I was ordering for my wife's birthday. but they will go on the kids beds and she'll get something else. Rated 5 out of 5 by tophat1850 from Nice single sheet. Nice unused poly/cotton bed sheets, too thin to call a blanket, well made, price is right. "Not" made from natural linen. Lable states poly cotton blend. Will see how they launder. May full up some. Good value.